In Japan, it's possible to buy any number of ivory products online. This does not sit well with the activist network Avaaz, which claims that while major brands like Google and Amazon are refusing to sell ivory, Yahoo Japan is making money off of elephants being killed. A recent investigation into Yahoo Japan by the Environmental Investigation Agency (EIA) found that between 2012 and 2014 more than 12 tons of elephant tusks and fashioned pieces of ivory were sold on the site. In an online petition with over 1.1 million signatures, Avaaz is urging Yahoo CEO Marissa Mayer and Yahoo Japan CEO Manabu Miyasaka to "urgently stop all ivory sales from sites/platforms in Japan and all other markets." According to Avaaz, Yahoo "is one of the few major online markets left" selling ivory. In response to the outpouring of criticism, Yahoo Japan, a joint venture between Yahoo and SoftBank, a Japanese telecommunications company, said on Wednesday that it is strengthening the policing of illegal ivory sales on its site. "Since there is a chance some sales may be illegal we are strengthening our policies. If we find a sale was illegal we cancel it straight away," said Takako Kaminaga of Yahoo Japan's public relations office. "We 'patrol' 24 hours a day." As far as Yahoo, Inc., company representatives told Gizmodo that while they "understand the concerns raised by this campaign…Yahoo, Inc. is an investor in Yahoo Japan and does not have controlling ownership. As such, Yahoo Japan determines their own policies…"
International trade in ivory has been banned since 1989 and last year China and the United States agreed to ban nearly all commercial ivory sales in both countries. But with the wholesale price of elephant tusks more than doubling from 2010 to 2014, according to the nonprofit group Save the Elephants, policing the black market remains a major problem. 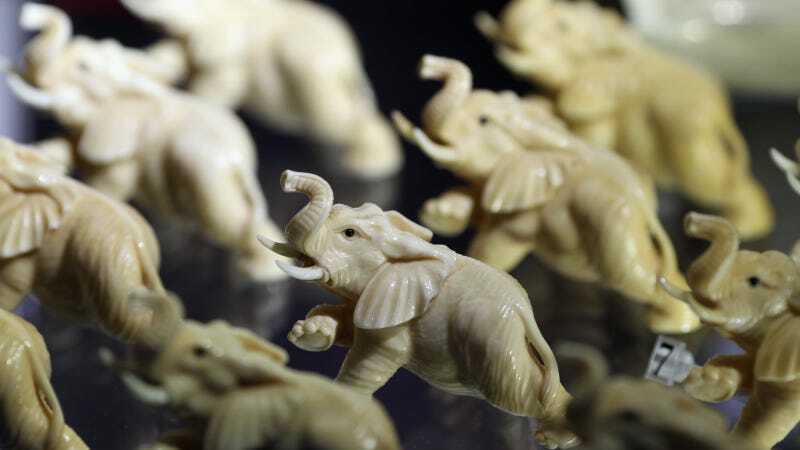 Yahoo Japan prohibits the sale of raw ivory and ivory products that breach the 1989 treaty, but Japan does allow for the sale of old ivory trinkets and other decorative items produced before the treaty came into effect. This makes enforcement even more challenging. Yahoo Japan operates an eBay-like auction site where several thousand pieces of ivory are for sale at any time, according to the Guardian, which found that "prices ranged from $20 for a trinket to $60,000 for a five-tiered pagoda carved in ivory." In 2015, Avaaz targeted Craigslist, urging the company to shut down illegal ivory trading on the site. Some 100 elephants are slaughtered by poachers for their tusks every day. According to the EIA there were more than 1.3 million African elephants in 1979, now there may be as few as 400,000. Tanzania alone has lost some 60% of its elephants to poaching over the last half decade—an average of 10-15,000 elephants each year. In response to the increasing urgency of the situation, burning this 'blood ivory' has become a way to take a stand against the rampant poaching industry. On Tuesday, the Sri Lankan government publicly destroyed its biggest ever illegal ivory haul, more than 350 tusks. Afterwards Buddhist, Hindu, Christian and Muslim leaders performed funeral rites for the slaughtered elephants. Sri Lanka is the first country in Southeast Asia to destroy its ivory, and to-date 16 countries have burned confiscated ivory caches. Kenya is planning a much bigger burn of around 120 metric tons of ivory—"the largest stockpile of ivory ever destroyed by any country" according to government representatives. To help draw attention to the late-April event and the cause of ending poaching, a number of celebrities are expected to attend, including Leonardo DiCaprio, Nicole Kidman, George Soros, Paul Allen, Howard Buffet and Michael Bloomberg. Last March, Kenya's president Uhuru Kenyatta set fire to a giant pile of 15 metric tons of ivory, which burned for several days. For inspiration, Japan could look towards its Asian neighbor Hong Kong, where the government recently announced it was taking "steps to ban totally the sale of ivory." A full implementation of the ban could take years. Let's hope the world's remaining elephants can last the wait.